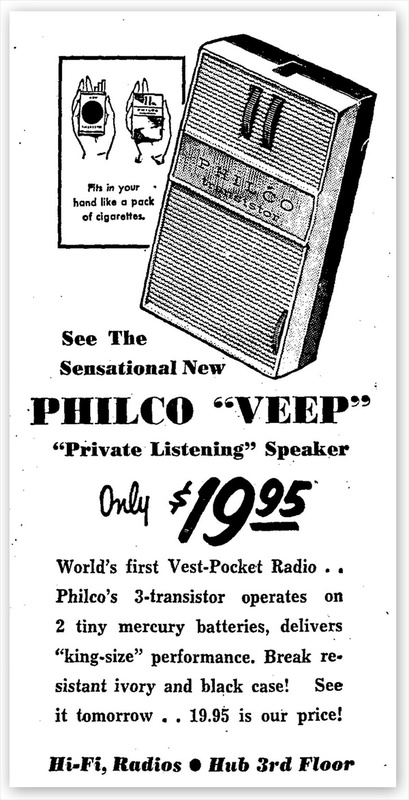 The Philco VeeP was manufactured in the USA and released onto the market in February 1958 (1a). 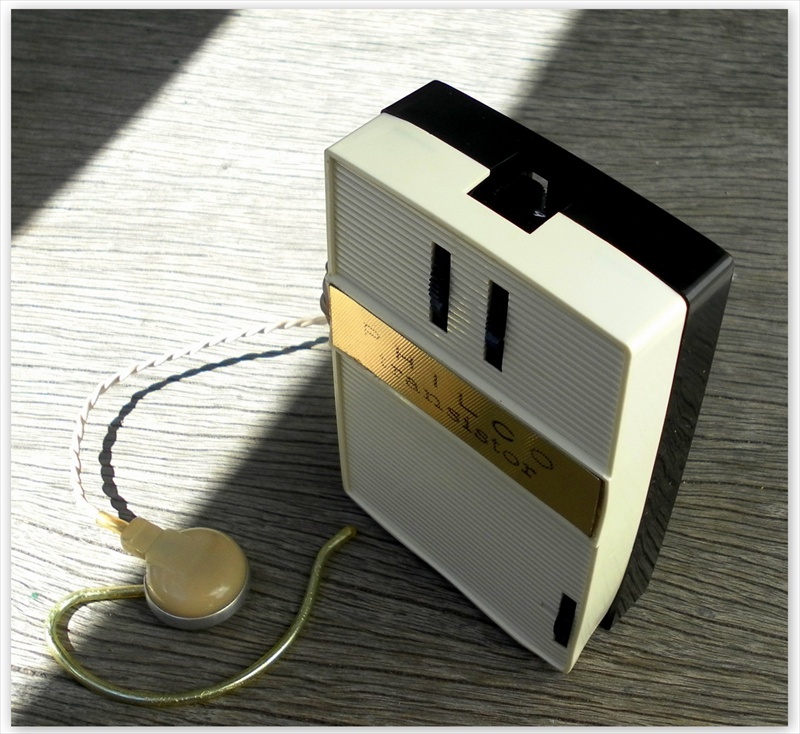 This is Philco?s first shirt pocket radio and their one earphone only model. In early advertising it was referred to as the ?Worlds first Vest-Pocket Radio? but that doesn't necessarily mean that it was...(b). VeeP appears to be an acronym of Vest Pocket. 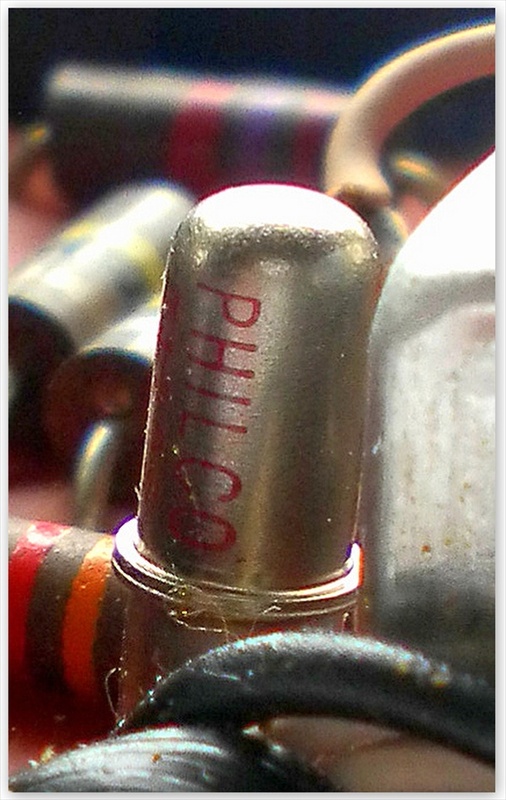 The Philco brand name appeared in 1919, born out of the fledgling Philadelphia Storage Battery Company. 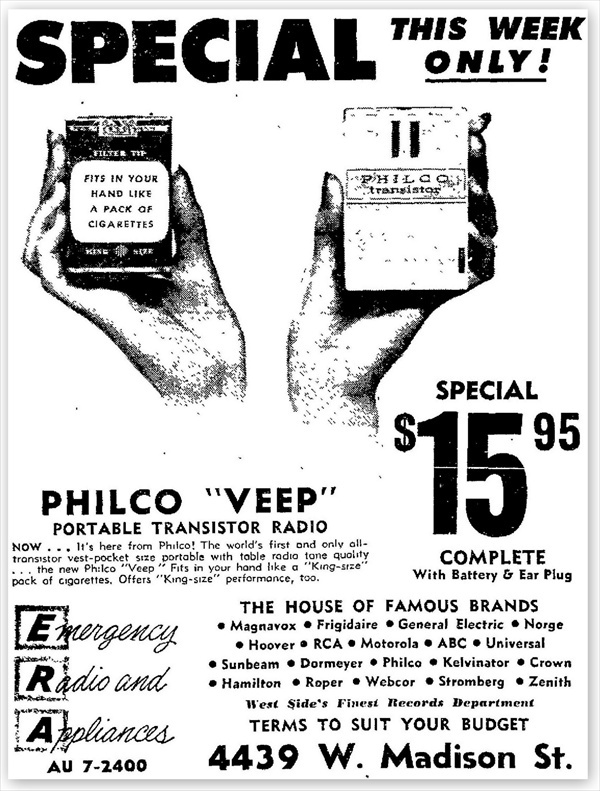 It wasn't until 1928 that Philco began selling radios, and by 1930 the company had sold over 600,000, grossed over $34 million, and was the leading radio maker in the country. Throughout the 1930's, 1940's and 1950's Philco continued making radios whilst expanding into other areas of consumer electronics. 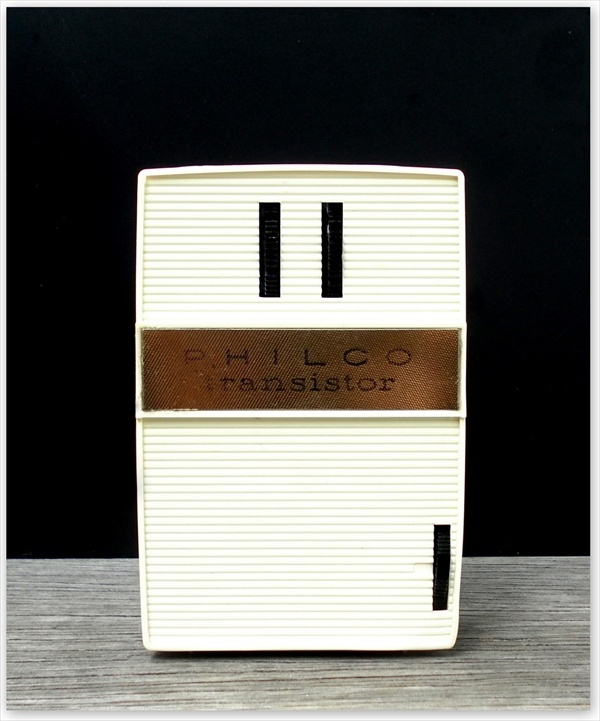 By 1954 Philco had sold over 30 million radios and was America's most successful manufacturer. 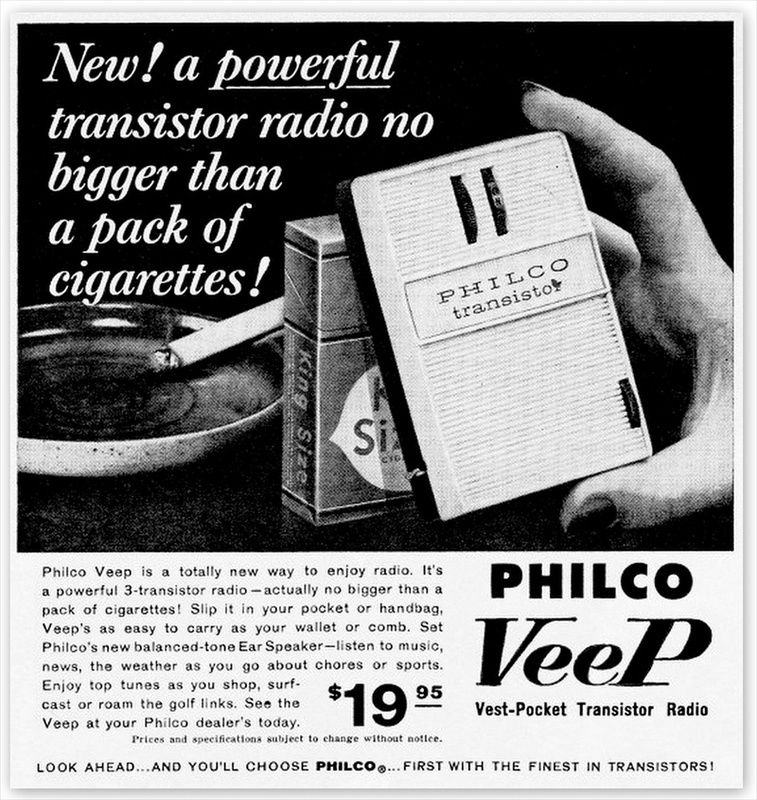 Philco released their first transistor radio, the T7-126 in 1956. Between 1956 and 1959 they released twenty two portables of which 12 were transistor models. Many of these radios were housed in dull leather cabinets and were very conservative looking, often resembling larger table top tube models. This was in sharp contrast to the small imported Japanese models that had begun to dominate the market. These little radios used contemporary styling with brightly coloured, shiny plastic cabinets, chrome accents and sported names like Zephyr, Vulcan etc. They were snapped up like hot cakes by rock n roll crazed teens and I suspect that the majority of Philco's portables were not. 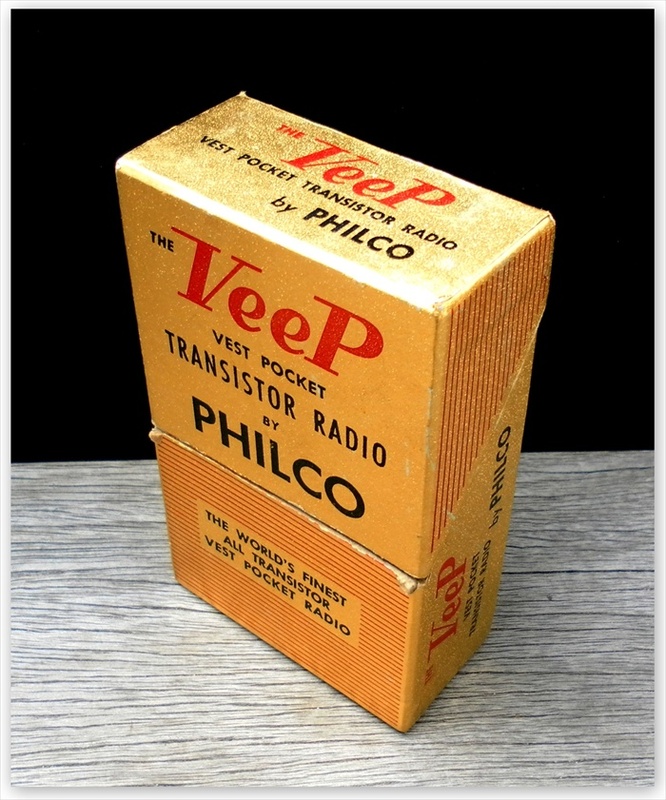 The VeeP was the only attempt at this time by Philco to head off the coming transistor radio revolution born out of the Far East. 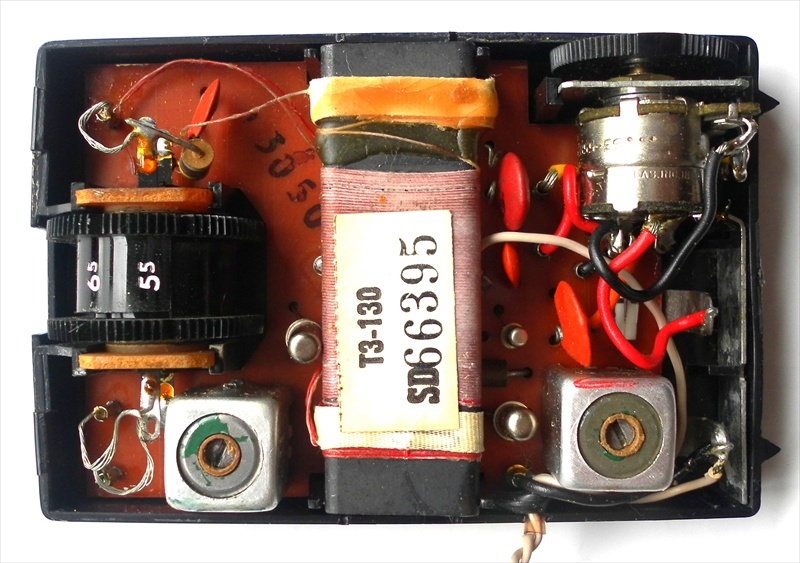 In 1960 they manufactured their last tube portable and released a further fifteen transistor radios but it was too little too late. Philco, like many other established American radio manufacturers could not compete against the tidal wave of cheaply manufactured Japanese imports flooding the country. In 1961 they were gobbled up and became a subsidiary of the Ford Motor Company. Radios bearing the Philco name continued to be manufactured for a while before Ford sold Philco to GTE-Sylvania in 1974. 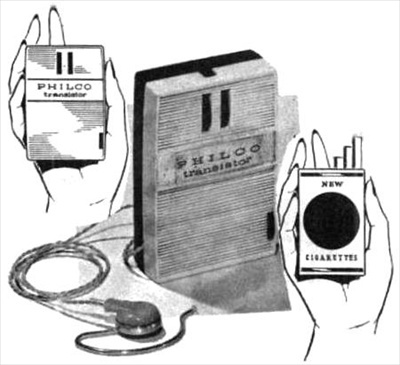 They are now owned by Philips who continue to use the Philco name for promotional consumer electronics (1c). Well I think I've worked out Philco's marketing strategy for this particular radio but unfortunately it was an earphone only model and that probably hampered it somewhat in the 'coolness' department. In this ad the earphone is conspicuous by its absence, it's nowhere in sight, in fact the word 'earphone' isn't even mentioned. Like the pioneering Privat-ear from 1949 the VeeP may have suffered the same negative association with large hearing aids of that era. Philco sidestepped this issue by calling the earphone an 'Ear Speaker' and hiding it away in this ad. Another problem they faced was that Japanese manufacturers quickly figured out a way to make radios the same size or smaller than the VeepP including an on-board speaker. I like the way that the advertisement at the top of this page features a packet of cigarettes that appears to have a radio speaker in the center of it. At first glance it looks like the hands are holding two radios... Very subtle and clever to associate the VeeP with the cigarettes and a mock 'speaker' in this way and as a consequence you almost overlook the earphone in this ad. Looking straight down at the 'open' tuning dial window located on top of the VeeP. The VeeP is a quirky little radio with a simple charm all of its own. It has an on/off volume control at the bottom of the louvered cabinet. The twin tuning dials are located on the front and run through to the back of the radio. These dials are operated by the thumb at the front and the forefinger at the back. This is quite an unusual setup. To tune the radio use the dial on the right to select the station and then fine tune it with the dial on the left that acts as a RF selector. You can view the station numbers from the top of the radio looking down at the open dial window. The VeeP measures 3.6" x 2.3" x 1" and as far as I can tell it only came in this one colour combination, referred to by the manufacturer as 'ebony & ivory'. Upon it's release it sold for $19.95 but by February 29th 1960 it was on sale for $8.88 in the Newport Daily News (1d). This is also the last advertised price for the VeeP that I can find. Another famous American manufacturer, Regency, also released a small earphone only model in 1958. The two transistor XR-2A would have been in direct competition with the VeeP. 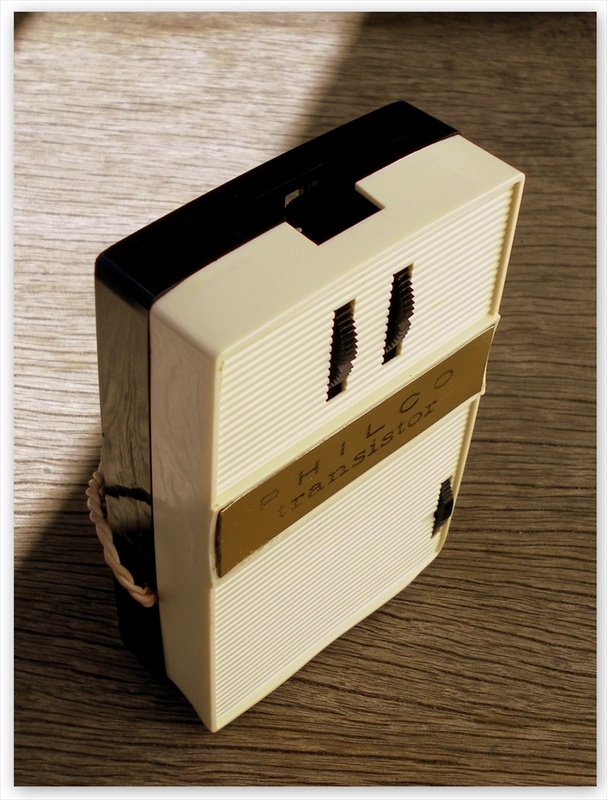 The earliest reference that I have been able to find for this radio was the announcement of its debut in the March 10th, 1958 edition of Billboard Magazine where it was advertised as a ‘new vest pocket sample radio’ and was selling for $12.50 or $9.97 in lots of six. 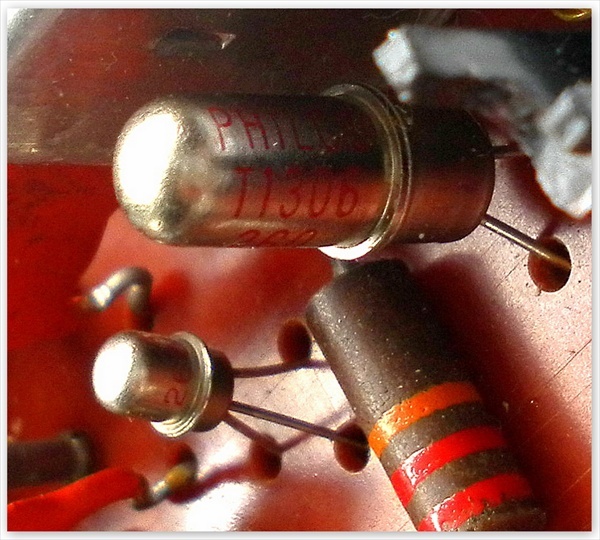 Although it was a bit smaller than the VeeP at 3”x 2”x 1” it used only two transistors and had no volume control. 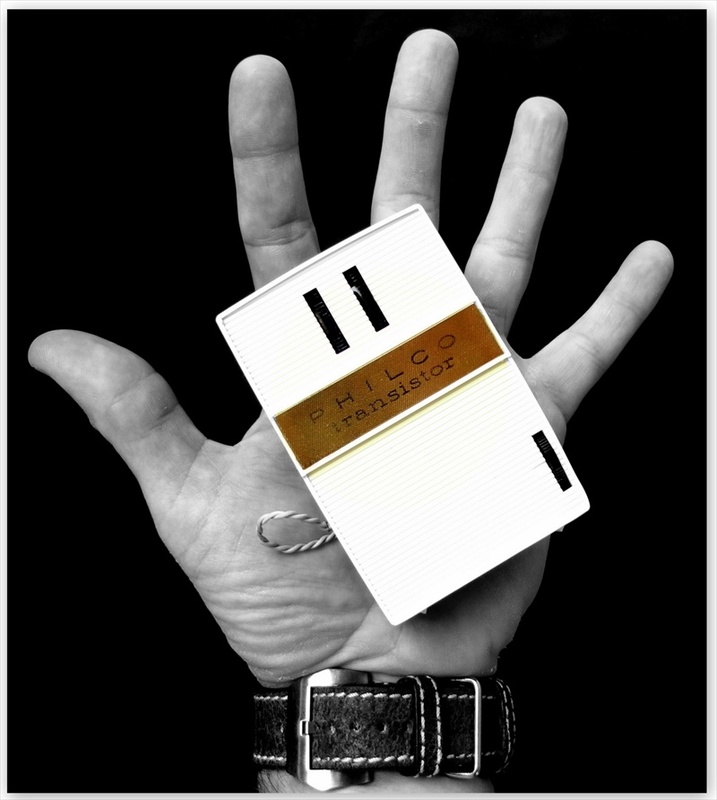 Fits in your hand like a pack of cigarettes! 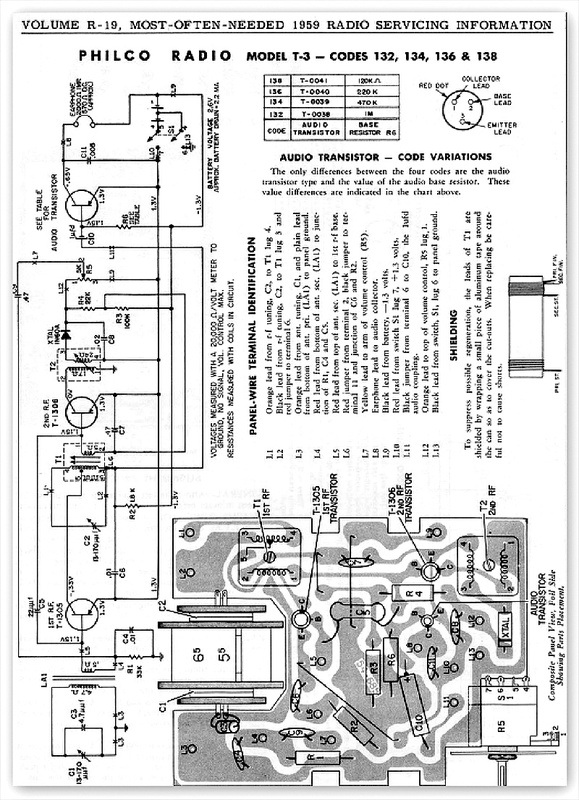 The station selector and RF tuner. Odd, but the gift box for the VeeP reminds me of... yes you guessed it! A packet of cigarettes!! Well who would have thought!? The top even flips open like a pack of ciggies. It is a very nice little box too, all gold and red with 'The VeeP' written on every side, including the bottom! 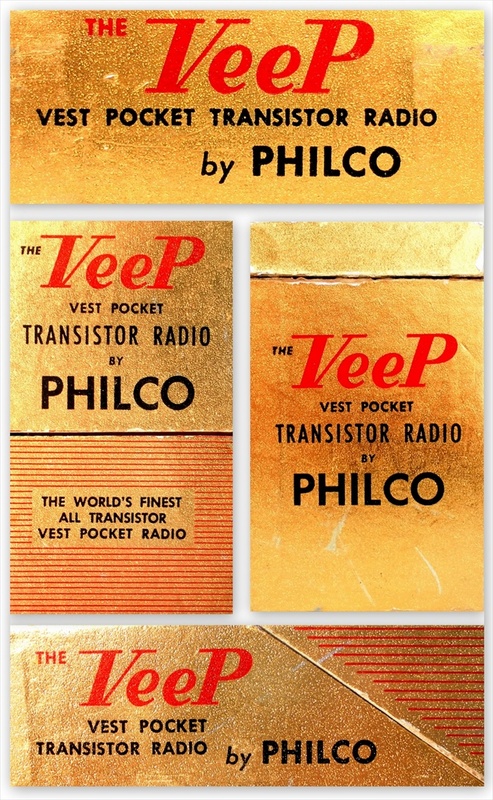 Throughout the VeeP's two to three year production run Philco used eight variations of model number 'T3'. This example is model number T3-130. All model numbers start with T3 and run as 124 (the earliest model), 126, 128, 130, 132, 134, 136 and 138 being the last model. It is powered by a couple of little button batteries, the kind you find in children's toys. 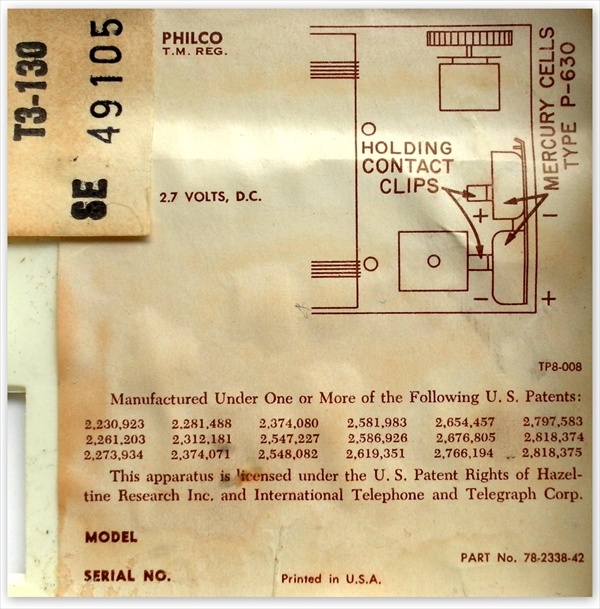 Philco refers to the battery type as P-630 Mercury Cells. Schematic for the earlier circuit 124 - 130. 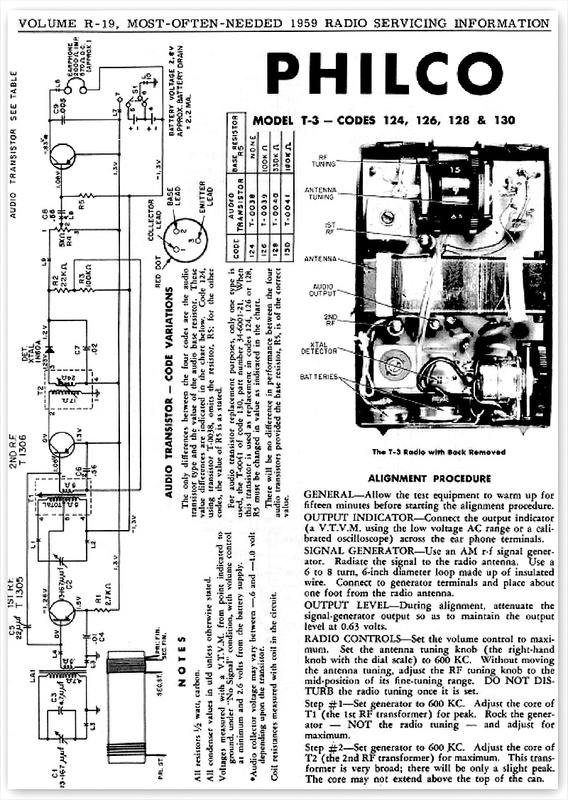 Schematic for the later circuit 132 - 138.